Precision Agriculture (PA) technologies are now becoming widely used in many industries across the globe. PA has traditionally focused on the development of sensing systems such as yield monitoring and satellites, and management strategies such as variable rate fertiliser application, but it is now much more than this. New advanced ground based sensing systems (Lidar and active optical), remote piloted aircraft, ground robotics, autonomous livestock monitoring systems and virtual fencing are now revolutionising the way we farm. Why study Precision Agriculture at UNE? 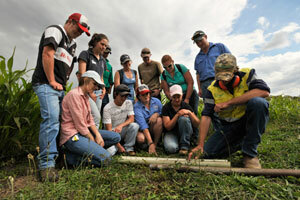 The University of New England's Precision Agriculture Research Group (UNE PARG) has an international reputation for undertaking research into the next generation of technologies across a number of industries from rangeland beef to intensive horticulture. 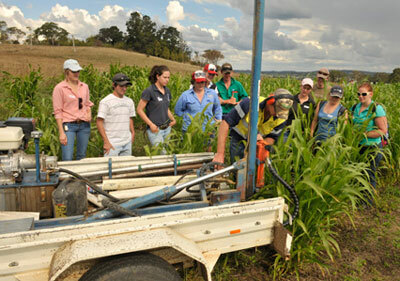 UNE PARG also offers a number of training opportunities that focus on Precision Agriculture, including undergraduate diplomas, post-graduate certificates, through to masters and PhD level research. Students learn the latest developments in PA and are provided with unique hands on experience in the application of a range of industry standard technologies including: EM38 soil sensing, satellite biomass imagery, active optical sensors, geographical information systems and uncorrected to RTK GPS devices. As UNE PARG is at the forefront of technology development, students also have the opportunity to use the latest innovations currently being evaluated, including GPS tracing systems for livestock, sensor networks, remote piloted aircraft and laser biomass sensors. In addition, students are trained in the use of a range of industry standard cloud-based data interrogation and management systems, including Pastures from Space and PA Source. 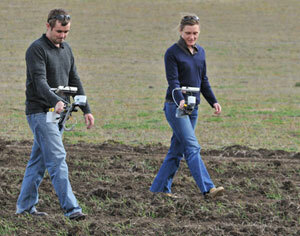 UNE Precision Agriculture Research Group has a dedicated SMARTfarm facility located just north of the UNE campus. This facility is fitted out with the latest landscape laboratory innovations including sensor networks, biophony systems, digital image animal capture and real-time livestock monitoring systems. Students have access to all of the standard PA tools currently used in the industry including EM38 soil survey, a range of ground based biomass sensors, airborne imaging systems and GNSS survey equipment. UNE PARG is also involved in the development of many new technologies which students have access to including advance telemetry systems, GPS tracking collars for livestock, radio beacon triangulation ear tag tracking systems for cattle, remote piloted aircraft (including a 8kg payload quadcopter) and laser scanning systems such as the Raptor multispectral and thermal system.